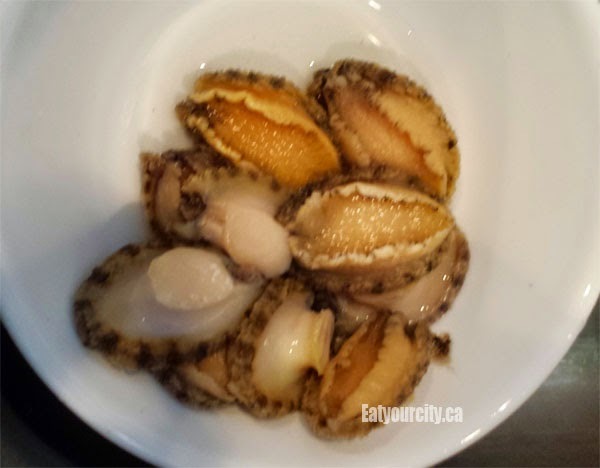 First off, being in landlocked Alberta, only flash frozen abalone or the dried variety was available. 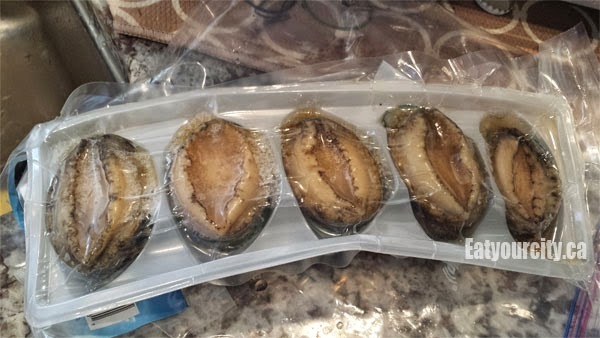 If you're lucky to live closer to the coast (or by/in Australia where they scoop some of the best fresh abalone in the world), do keep in mind they only last a few days so cook them quick after you pick them up. I defrosted mine overnight in the fridge... some were still partially frozen, but they got lots of rinsing as I cleaned them so they finished defrosting during that process. 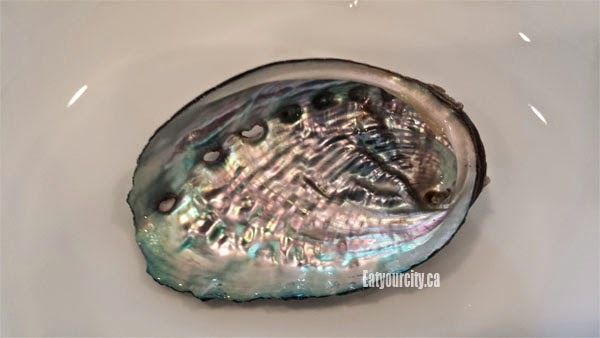 If you want to keep the pretty shells as soap dishes, make sure they're clean of all meat, run them through the dishwasher, or boil them for 5-10 min to make sure they're clean before you do artsy stuff with them. Me, being not the artsy type... all dem purty shells promptly found a home in my garbage bin. Step 2: Remove the poop sac. Trim off the mouth. Rinse. Rinse. Rinse. 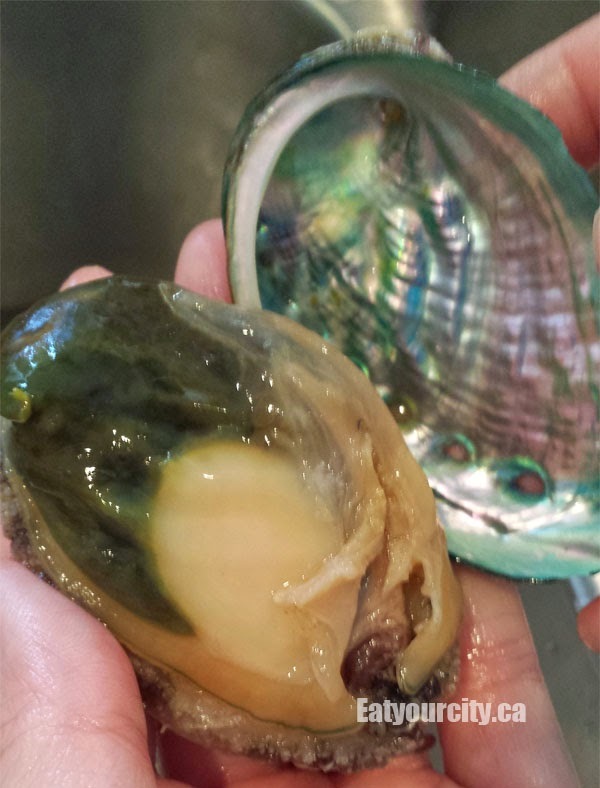 Gently pull off the dark grey/green/black softy squishy blob and discard.. it holds all the abalone organs and poo, and if you're too rough it explodes open to leak everywhere... running tap definitely came in handy for a few that leaked open. Do not attempt to cook it, it is not edible.. and really,why do you want to eat a poop sac?! 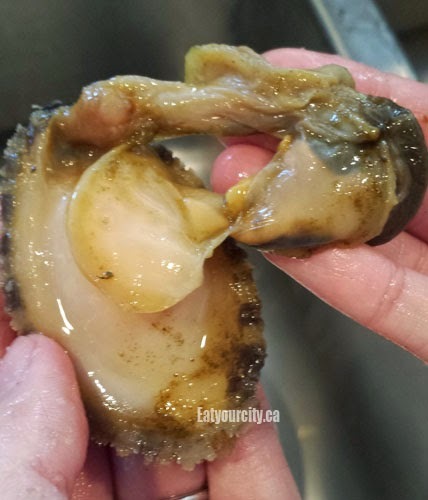 Using a small knife, cut off and discard the mouth - its the dark black tip on the abalone where the poop sac attaches to the meat. There's a few ways to do this - all of them hotly debated as to which method strips flavor/ cleans them the best. 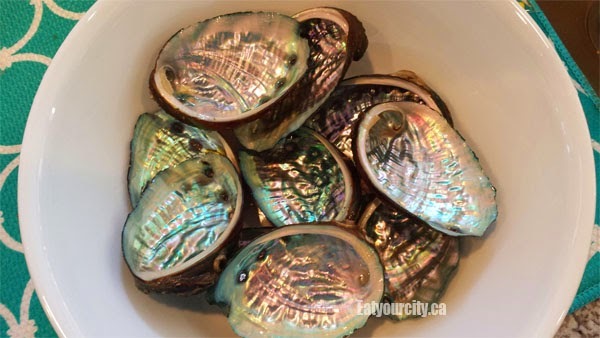 Since I was making this for family to eat, I wanted them to look nice and really, abalone is so flavorful, I doubt any cleaning method could strip a significant amount of flavor away. Do clean using at least one of the methods below (or all 3) as they are filter feeders and they are pretty grimy! After the salt scrub, a light scrub with a bit of baking soda really removed the rest of the grayish grime and they looked a lot better nice and clean! Now they're ready for cooking! Forgot to take a picture of the finished product before everyone dug into them. 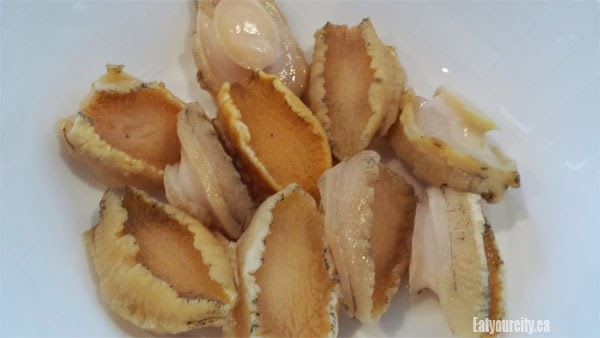 Note - fresh/frozen abalone shrink to half or more of its original uncooked size, while dried abalone retains its size throughout cooking... so be prepared to see the fresh ones shown in my pics that were finger tip length super shrink to a small mouthful. 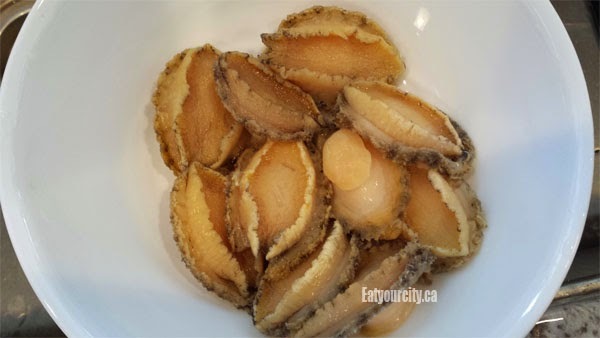 Braised abalone with dried scallops recipe - can use fresh, frozen or dried abalone! 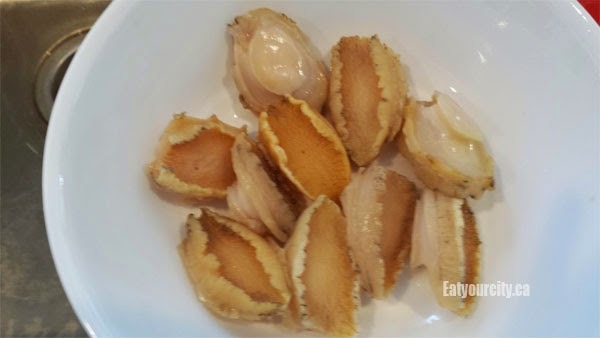 *If using dried abalone, scrub well, increase stock to 6 cups, and toss everything into a slow cooker on low for 3-4 days until tender. 3) Using a wok or deep frying pan, heat oil on medium high heat, add garlic, ginger and white part of green onion. Sauté for a minute until oil is fragrant. 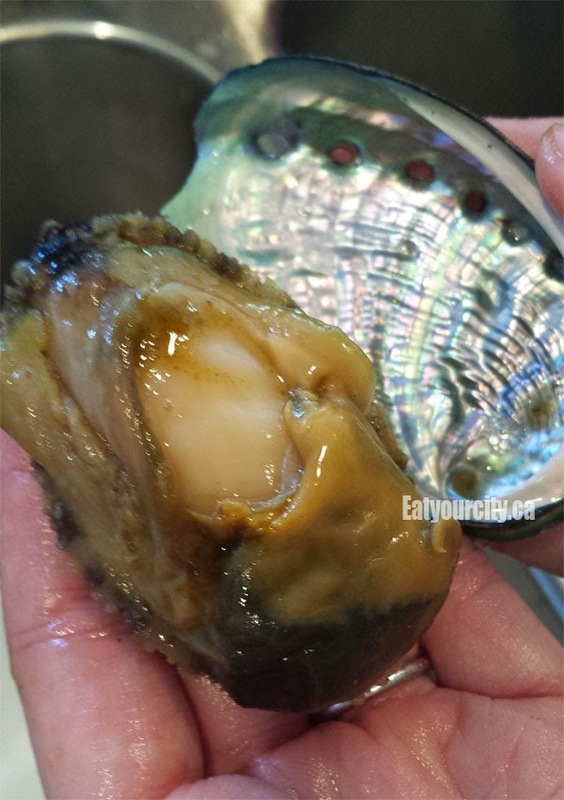 Add in cleaned abalone, toss. Gently mix in all the other ingredients. Bring to a boil. 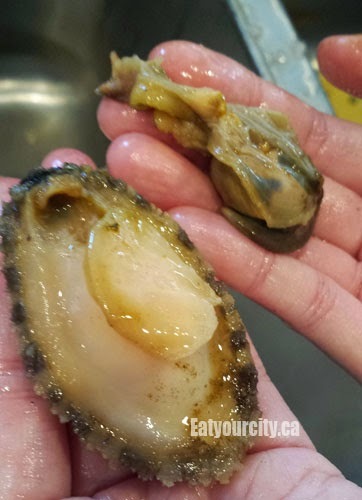 4) Lower heat and simmer for 6 min for medium abalone (about size of a large egg), up to 10 minutes for larger abalone. If the sauce thickens too much, add in some of the reserved scallop liquid. 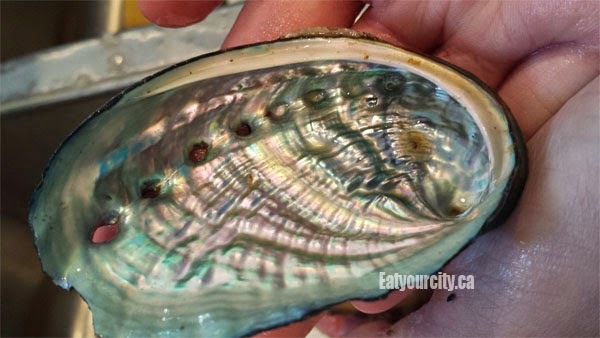 5) Season to taste, add in abalone sauce if using, garnish with green parts of green onion.